The Rhone Rangers rides the waves into Santa Monica again! 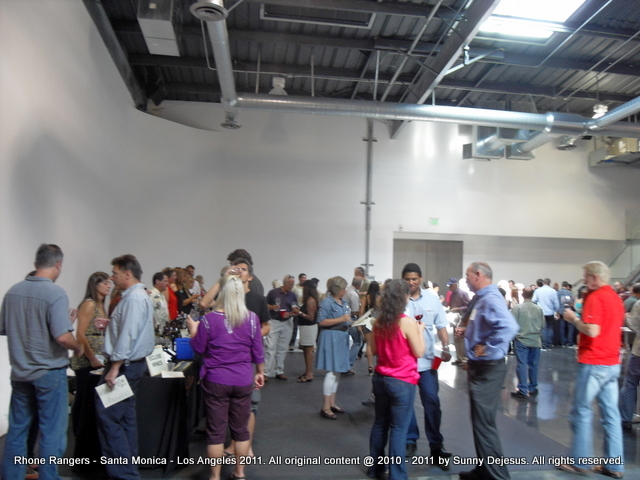 Yesterday I attended The Rhone Rangers wine tasting event at the Pier 59 Studios West in Santa Monica’s Bergamot Station Arts Center. It was pretty nice to see The Rhone Rangers Wine Association return to the Los Angeles area, because I’m huge fan of American Rhone varietal wines. What made this year’s event different were many boutique wineries in attendance that I’ve never heard of. I was lucky to run into a friend of mine, John, who is more of a wine drinker than me yet, very knowledgeable of wineries in California. He always gives me good recommendations on wines. This time he pointed me into the direction of Donelan Wines, a winery from Santa Rosa, California in the Sonoma Wine region. It turned out to be the best start of my wine tasting experience. 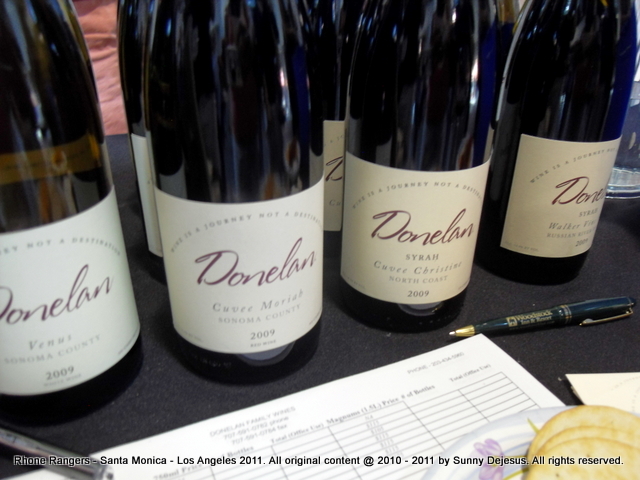 Donelan Wines poured a 2009 Syrah called Cuvee Christine and a 2009 Syrah wine called Walker Vine Hill Vineyard. Both are single vineyard vintages, elegant Syrahs yet distinctly different from each other. The Cuvee Christine had a little more refineness of the dark, heavy dark berry flavors with a hint of a little ginger, and some smokiness. Walker Vine Hill Vineyard had a nice chewy bite of dried dark fruits and berries with some stone pebbles and a little bit of slate. Both wines would be excellent grilled steak wines. I tried these wines with a sampling of cheeses and I loved that the cheeses mellowed the tannins. Another favorite of mine, and coincidentally the 2nd recommendation from my friend John, was Wind Gap Wines. After tasting Wind Gap, I found it to be the more sophisticated wines that I tasted at The Rhone Rangers wine tasting event. All of their Syrah wines and their red blends poured reminded me of why I fell in love with Sonoma County Rhone varietal wines to begin with. Oh gosh, Wind Gap Wines has magnificent wine making. Wind Gap does a phenomenal job in bringing out the distinctive rich and lush earth tones of the grapes that Sonoma County is known for. I tasted the whole arsenal of wines that Wind Gap showcased. As I went down the line, every wine got better and better. I absolutely love their syrah, but in the end, the 2008 Rana and 2009 Orra, both GSM (Grenache, Syrah, and Mourvedre) blends, were my favorite red blends of the day. Lots of aromatic spice, licorice, dark berries, leather, pepper, and crushed stones. In between discovering new boutique wineries and chatting up with my friends, I visited my regular favorites like Stolpman Vineyards, Jada Vineyard and Winery, Michael – David Winery, and Halter Ranch Vineyard. However, I have to give credit where credit is due, because I also tasted some of the best wines from other boutique wineries that I have never heard of. For instance, Holly’s Hill Vineyards had a delightful 2009 Roussane and a 2010 Viognier, which retails at an affordable $22 to $27. Kaleidos from Paso Robles, California had remarkable Syrah wines. And lastly, Frick Wines brought the largest selection of affordable white and red Rhone varietal wines to taste. They had two awesome red GSM red blends called C2 and C3.